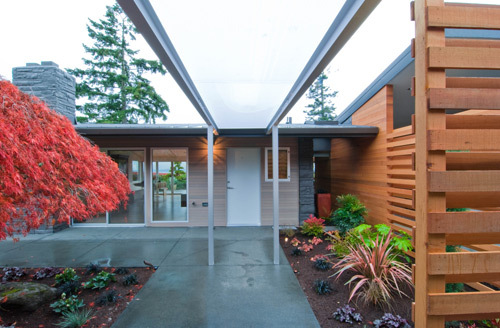 BUILD LLC just completed the substantial renovation to a mid-century modern home in Seattle’s Innis Arden neighborhood. We thoroughly enjoyed working on this project and couldn’t be more proud of the finished product. There are a couple of key ingredients essential to a project as rewarding as this. We’ve said it before and we’ll say it again –behind every great project are extraordinary homeowners and this project is a perfect example. 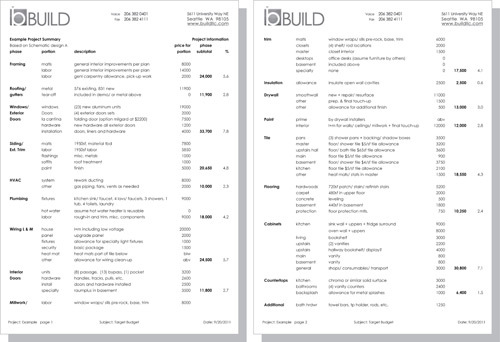 They courageously dove into the adventure of design and construction and we are absolutely honored to have worked with them. 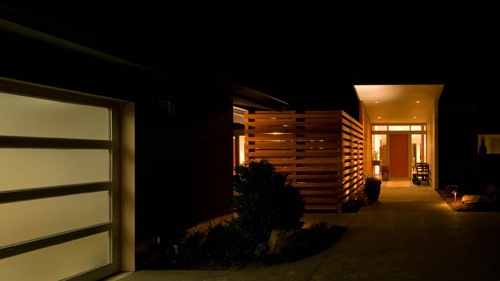 The existing home itself incorporated clean lines and a straight-forward design. 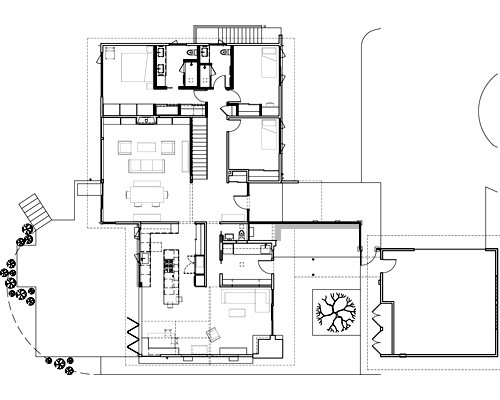 The original floor plan was open and flexible, the framing was in good shape, and the foundation was solid. All things considered, it was a great departure point. A package of smart architectural moves allows the house to be functional and inspiring for another 50 years. Today’s post addresses the exterior strategies of the remodel and we’ll cover a bunch of materials, methods and behind-the-scenes process. The entire remodel kept to the original envelope, which includes the home and a detached garage. New 1×4 vertical grain T&G (tongue and groove) siding was installed on the house and garage; this siding was positioned horizontally to reinforce the long, low lines of the original home. The siding was finished with a gray Sikkens Cetol SRD stain. The stained cedar compliments the anodized aluminum window package, the Marlin 1505 series, chosen for its high thermal value (thanks to the Solarban 60 Low E & Argon filled glass panels). We used the roto-hardware on operable windows to maintain the clean, machined look of the window package. 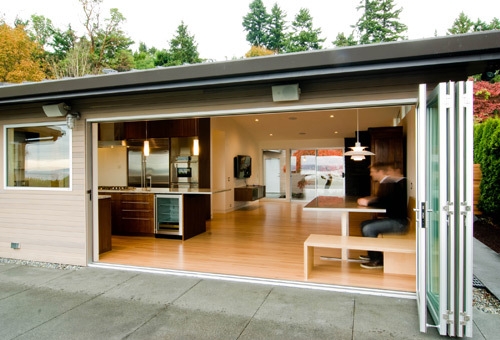 At the garage, the Modern Classic P516 overhead door by Select Garage Door is made of anodized aluminum and obscure glass. It creates a nice glowing affect at night and looks crisp and clean in the daytime. If you follow the BUILDblog you may remember that we struggled a bit with the original stonework on the house. After trying some different methods, we decided to paint the stone with a Laxon XP Waterproofing System from Sherwin Williams. 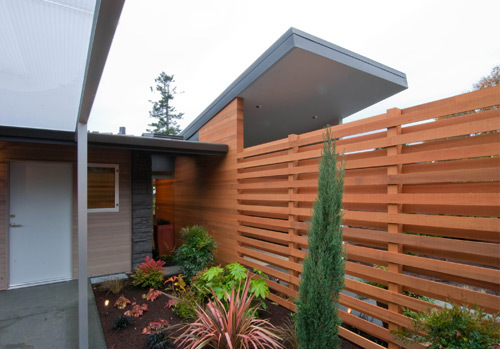 The color works nicely with the stained cedar siding as well as the natural cedar of the fences and screens. The soffits are sheathed with MDO plywood and finished with Sherwin Williams paint. Perimeter soffits are painted dark to fade back in the shadow lines, while the underside of the entry roof is painted white to be more inviting. The lighter color of the entry canopy celebrates the entry and matches the interior ceiling, providing a visual link between the outside and the inside. To help guide visitors to the front door and warm up the entry composition, we used a screen of 1×4 vertical grain cedar boards from Woodtone and finished the cedar with a light penetrating stain. We reviewed the cedar screen details in a previous post that you can find here. The cedar screen transitions to a cedar partition that then transitions to a solid cedar wall at the interior of the home. The screen lends privacy to the courtyard between the house and the garage and gives the entry sequence a continuity of material. 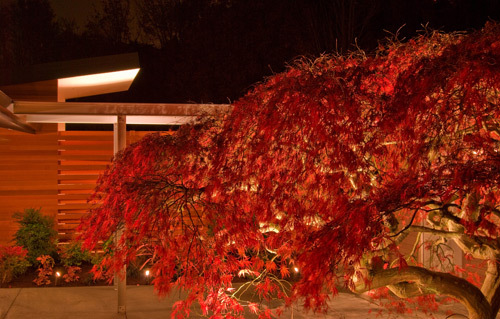 The courtyard has become home to a relocated Japanese maple and, thanks to the fall colors, the courtyard is a gorgeous exhibit of color. Between the house and garage we designed and built an attenuated canopy from sleek aluminum I-beams that support a double-wall translucent plastic membrane from TAP Plastics. Patios, walkways and the driveway were all poured new; expansion joints were cut in afterward, providing a crisp grid pattern on the hardscapes. The landscaping was designed by Stacie Crooks and implemented by Mike Malcham of M-Two Contracting Co. The new roof is the Kynar 500 24 gauge Easy-Lock standing seam metal system made by Taylor Metal Products and it comes in 12” wide panels. It’s placed over an ice and snow shield underlayment. 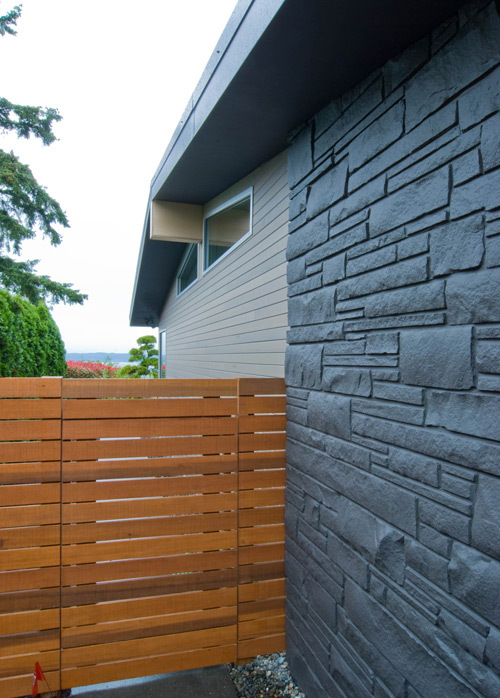 We used a dark bronze for the color to minimize reflections at adjacent homes, we also like the look of the darker composition with the light gray siding. New flashing, downspouts, and seamless gutters are color matched to the roof. For exterior lights we like to use the RAB VC100DG series, they’re a tough industrial light that can weather a good storm and look good doing so. At the entry canopy we soften things up a bit and use Lightolier 5 inch recessed cans with Alzak trim and halogen lamps. The front entry door is vertical grain fir veneer with a strand lumber core, the jamb is a single rabbet kerf for a simple function and clean, modern aesthetic. 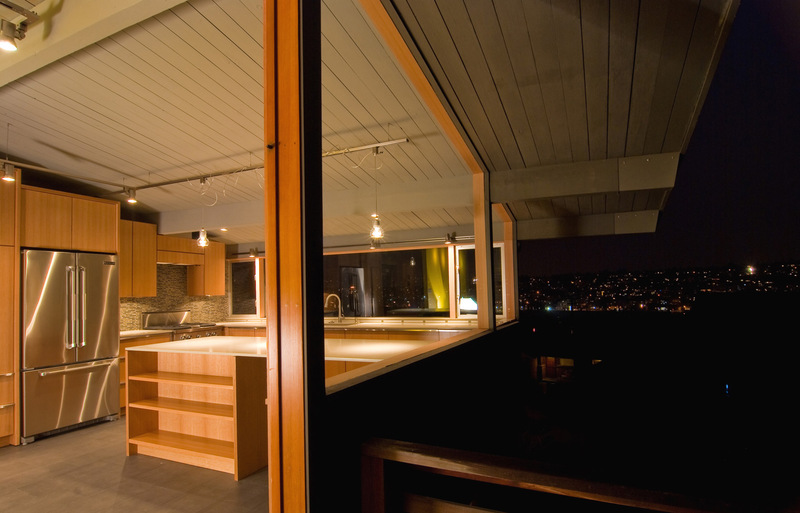 At areas of low traffic, we used Milgard aluminum sliding doors to keep plenty of light and view coming into the house. 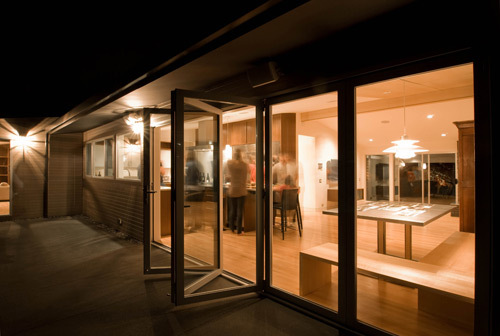 The doors between the kitchen and the back patio receive a great amount of traffic and we used the La Cantina Bifold door system with tempered glazing, covered in detail here. The far left panel is operable on its own as a passage door, the remaining doors accordion open up to a maximum opening of fifteen feet. 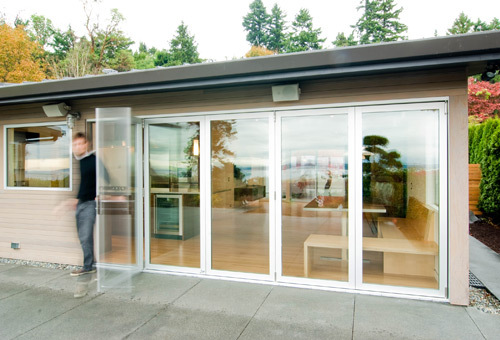 The intent was to create indoor/outdoor spaces when the weather gets nice here in the Pacific Northwest. Stay tuned for part 2 of the series where we tackle the interior of the home. Cheers from team BUILD and if you’d like to keep a pulse on us, jump on board Twitter. WOW, you guys are f$ckin’ MASTERS at incorporating modern into old…one of the hardest things to do in architecture!…great work once again. 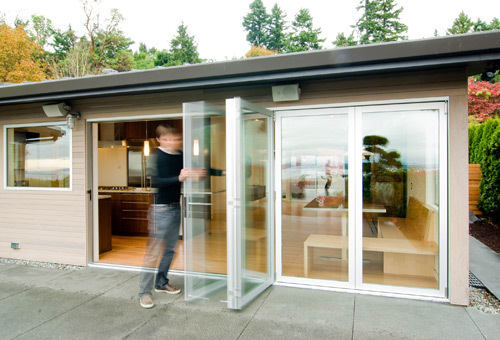 This is the greenest work you can do because it keeps one more home out of the landfill….I love the built-in table. I could never find Milgard Aluminum Sliders over 6′-10 in the Northwest (Milgard said they didn’t make them over 6′-10″ anymore because of problems with the rigidity? )…those look like 8′-0? Where’d you source those? Nice project. One question – on the cedar screen wall that becomes solid cedar wall – is it really T&G? The screen wall cedar slats don’t have a tongue and groove, and in the previous post you mention that it is face nailed. If the wall is t&g, did you use square stock boards for the slat wall and remove the tongue’s of the boards where they weave into the solid wall? Just curious. @ Nicholas -thanks for the kudos. Yep, the house is greener than most “green” design. The Milgard sliders are actually the standard 6′-10″ version -the scale on the west side of the house is a bit misleading and the header is quite low. @ Sean -good catch, the cedar boards at the screen/partition/wall are NOT T&G. We’ve corrected that in the post – thanks for the quality control. Thanks for post guys! Companies like Marlin Windows should be using your photos for their marketing. Despite how great their windows look in your projects, it’s a real stretch to review some of these supplier websites and imagine that their products could look sharp on a modern residential project – their photos are just terrible. @Gus -we hear ya. Going to all the trouble of generating and maintaining a website just to use mediocre images is a shame. Especially when the product is solid (like Marlin Windows). @Alex -thanks for the kudos. The La Cantina doors have a weather seal and a flange at the top and bottom and meet the rigorous energy code. This winter is supposed to be a doozy here in the northwest and it should be an excellent test of the system. Have you used the Sikkens line for exterior finishes in the past? If so, what has been your experience in regards to durability? 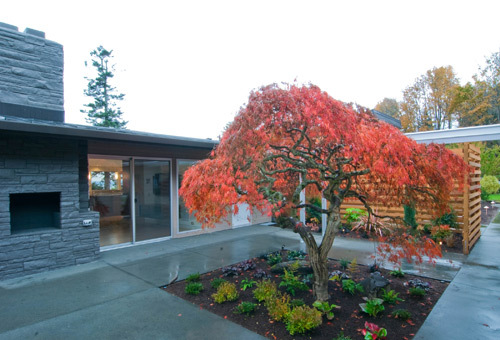 We and our clients often gravitate towards the warmth of cedar, but required long-term maintenance is always a drawback when compared to, say, a cement-based product. Any sense for how often re-sealing is required? Tyler- we’ve had the best longevity with Sikkens over a couple of other vendors. Sikkens is a penetrating finish so it isn’t subject to failing like surface finishes that may eventually flake off due to the subsurface becoming compromised. And, we tend to use semi-transparent products that have enough pigment to protect the siding for much longer than a simple clear finish. We try to pick our cedar areas judiciously. On this project, the house siding is entirely covered by eaves so we feel like the refinish on this is at least a decade away. For the screen wall, the majority is also undercover; the portion that extends beyond cover will most likely need to be wood-conditioned and re-stained every few years. We (the whole team) thought that the composition was worth the future maintenance in this area. I really like the Sikkens gray over the cedar. Which gray did you use? How does this perform? I’ve seen that in some projects you use Milgard windows and in others you use Loewens. Which ones you think are better? I’m looking for windows for a very modern glazed pavillon. 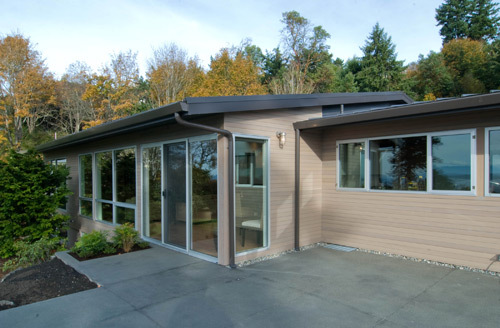 @Damian -because of the new energy code here in Washington State we’ve been using Marlin windows lately (Milgard no longer meets the energy code here). 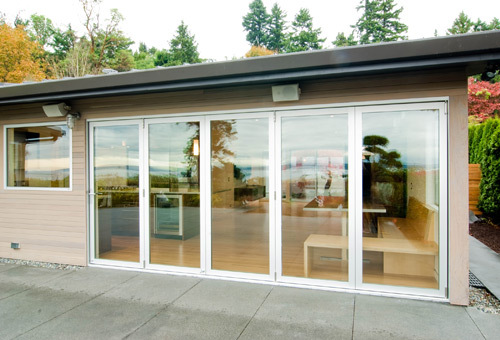 The clear anodized aluminum windows from Marlin are simple and modern; they compliment the work we do quite nicely. Oh my God,this house built with a class,modernizing a house like this is really want i want to achieve int he future.Thanks for posting,you guys are so great! I’d love to know which Sikkens grey you used on the cedar. hey! nice job guys! i was wondering what type of fasteners you used for the MDO soffits….galvanized or stainless steel nails or screws? how did you conceal them? did you specify single or double faced for the MDO? 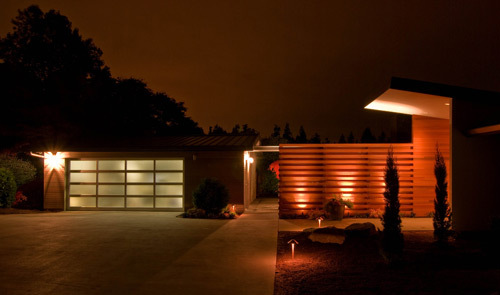 I’m getting my new cedar garage done this week and love what you did with the siding here. How do you think the 1×4 vertical grain T&G (tongue and groove) siding will hold up with the rain etc…did you have to seal each of the joints? Any concerns or maintenance issues? @Laura -the T&G cedar will require more maintenance in an exposed location like the entry screen -we’re very judicious with such applications. We seal all sides of the board before install. The screen wall will need to be re-sealed every 5 years or so. If possible I’d love to know what Sikkens grey was used here. I’ve tried a few samples and can’t get it right. @Erik, I did some testing with the Sikkens products and also couldn’t get the look I wanted out of the Semi-Transparent SRD products: http://www.sikkens.us/en/Products/SelectedRetailers/Exteriors/Pages/CetolSemi-TransparentSRD.aspx They end up feeling like matte finish paint in my opinion. I ended up with the Ceto SRD Cape Cod Grey: http://www.sikkens.us/en/Products/SelectedRetailers/Exteriors/Pages/Cetolsrd.aspx Problem is it isn’t available in some states cause of VOC rules. Though you might be able to get it online. I ended up getting the desired tone from Benjamin Moore. They actually offer a great variety of colours in solid, semi-solid and semi-transparent. Although I’m not sure how Benjamin Moore Arborcoat compares to Sikkens in terms of durability. Nice project. I’m having gutter/budget problems right now and am curious about the gutters you used. You called these seamless gutters – do you mean the standard ‘fascia’ type gutters used by builders all over? Or are these custom? If so, are they 10′ sections? 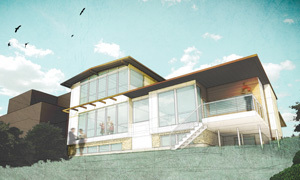 Love the standing seam roof. 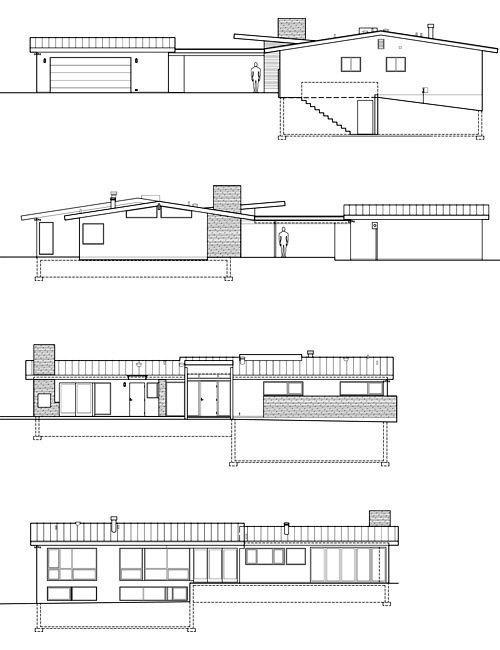 Do you have any recommendations for who might install one a Mid-Century Modern flat roof in the Northeast (CT)? We don’t have that many flat roofs around here, so I’m not sure who would install it and what the right product would be. Thanks! @ Alec -unfortunately we don’t. We haven’t done any work in that part of the country.